When the economist worldwide regards that the core to happiness is acquiring material wealth and enjoying it, Bhutan, however, comes up a notion that accumulating material wealth does not necessarily bring happiness. The country’s belief contradicts with the rest, as it believes in measuring its progress via Gross National Happiness instead of the common idea of Gross Domestic Product. Bhutan’s philosophy of Gross National happiness is worth pursuing after! When the cultural inheritance of most of the countries has been lost, Bhutan is on a quest to defend its culture, value, overall Bhutanese way of life along with the sustainable development of the entire nation. Today, there is no other place in the world as Bhutan that maintains an equal blend of modernity with traditions. By challenging the dynamism of time, the country embraces happiness over GDP, eventually becoming the happiest kingdoms in the world. Now, what does pursuit of happiness really mean? The pursuit of happiness means to chase after whatever that makes one naturally happy. On the quest for attaining the GNH, Bhutan does not overlook the country’s economic development. Rather it seeks to maintain equilibrium between spiritual and economic development. 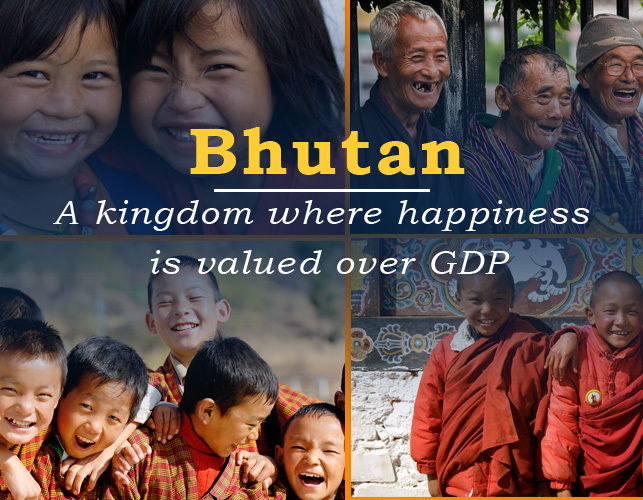 The notion of Gross National Happiness has immensely encouraged development and helped the attainment of happiness as the essential philosophy of life in Bhutan. GNP has highly influenced self-reliance and contentment and has eventually reduced the gap between the rich and the poor. Besides, it led to the empowerment of the citizens as well. Cultural and spiritual heritage is the essence of human values and beliefs that are of endless importance and meaningful for the sustainable growth. Thus, it is crucial for the tiny kingdom like Bhutan to preserve them as a sense of identity in the rapidly changing world. The spiritual beliefs and environment promote primary values like kindness, tolerance, love, respect, for the peaceful co-existence between nature and mankind. This small country has bigger commitments when it comes to conservation of the environment. With a thriving strategy guided by Buddhist morals, Bhutan has taken a major step to conserve the environment by embracing the philosophy of Gross National Happiness. Conservation of environment with GNH is evident from the fact that Bhutan owns Asia’s largest protected areas, native wildlife, and the country’s 60% of the land is under forest cover. One of the most precious endeavors is an individual’s quest for happiness and freedom. By embracing the philosophy of GNH, the last Buddhist kingdom is committed to establishing the government that emphasizes on well-being and the happiness of the citizens. Focusing on the country’s strong ancient society and the genuine merits of the democracy, the government continues to lead the country towards achieving that vision of fruitful and better administration. In this rapidly changing world, it is extremely challenging to maintain these elements through the method of maintenance. The major challenges to sustainable development are; climate change, poverty, unemployment, building better institutions and administration, forming a peaceful society, humanitarian aid, etc. GNH has contributed immensely to making the changes for better. GDP would increase when expenses for dealing with the natural calamities like landslides, flooding, and road damages are needed. If the timber of Bhutan gets cut-down for profit, then GDP would increase. If any citizen embraces the modern lifestyle that leads to ailing health, then financing in the healthcare too would increase GDP! The rate of GHN has considerably increased from 2010 to 2015 by 1.8%. Significant improvement was seen in women, elderly, the ones with no formal education, and farmers, eventually increasing from 40.9% to 43.4%. The idea of GNH has greatly empowered the quest for overall development. Thanks to GNH, because, according to a pilot survey, 68% of the Bhutanese are immensely happy with their lives.